I don't use the NaNoWriMo website for anything other than updating my word count and seeing my personal stats (which, I'll admit, aren't looking too great right about now). The site has a lot of other interesting and/or helpful stuff, but these all seem needless distractions from actually writing ("Oh, and blogging here isn't?" you ask, to which I respond, "Quiet, you!"). Some stuff offered by the site includes details of "write ins" where writers are invited to write in bookstores and libraries (which, even if it existed in Israel, wouldn't appeal to me - see my day 2 post about writing in public - though I have admittedly been seen writing in public recently), and of course the usual forums and pep talks for writers. It seems all I really need, though, is guilt, so please be sure to continually nag me on this blog, through Twitter, or if you're a friend, on Facebook or in person. "All writers are vain, selfish, and lazy, and at the very bottom of their motives there lies a mystery. Writing a book is a horrible, exhausting struggle, like a long bout of some painful illness. One would never undertake such a thing if one were not driven on by some demon whom one can neither resist nor understand." 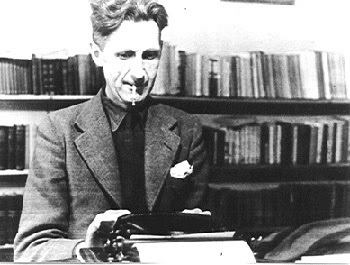 - George Orwell, "Why I Write"